The School of Engineering Library is one of the largest libraries that caters the learning and teaching requirements of the staff and students of School of Engineering.The SOE library ensures the availability of current titles by browsing publishers printed catalogues, searching in online books shops, reading reviews, and receiving recommendations from faculty and students from all branches of teaching. The faculty concerned identify prominent journals. Books and Indian journals are being procured by the library. Foreign Journals are subscribed and supplied by the University Library. It also offers M. Tech Courses in various branches. The annual intake of B. Tech courses comes around 630 numbers of students. There are currently 2200 B.Tech students as members of the library. 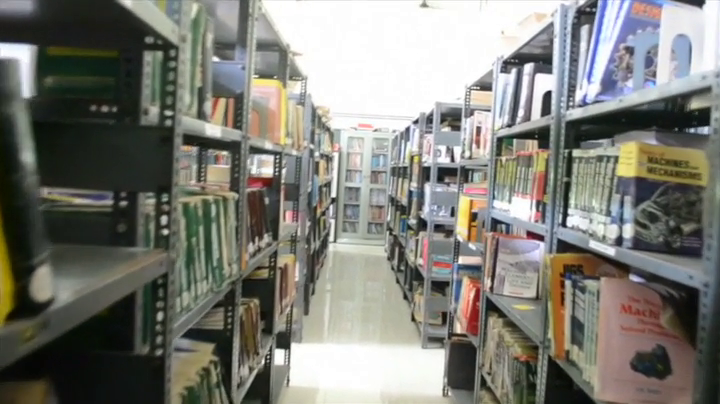 The School of Engineering (SOE) library is providing free and equal access to all faculty, research scholars and students of the School. Being the members of the School, they automatically become the members of the library. Open access is provided to ensure free searching, selection and use of library materials. Library tickets are issued to members for lending the books for outside use. The reading room of the library provides around 50 seats for study and reference. The library is kept open for 9 hours a day from 9 am to 6.00 pm without break. The library functions are managed by professionally competent staff members. The library keeps the resources in a secure environment for long use. Proper vigilance is provided at the entrance to verify the materials being loaned. The SOE library has 9 Desktop Computers (Pentium D) with DVD drive and a server. There are two laser printers and one flatbed scanner. The library has one digital photocopy machine that can also be used as a printer and scanner. The library is providing internet access to members. The computers are also used by students for accessing information available in CDs/DVDs available in the library. The library is fully automated using KOHA open source software. The issue and return of documents are being done using KOHA. The online catalogue of the library can be accessed via campus LAN. The catalogue also displays the current status of a material. Members can view the materials they borrowed and the due date. The SOE Library is maintaining a Digital Library built using DSpace open source software. (http://dspace.cusat.ac.in/jspui/) . More than 5000 Question Papers, Syllabus of All Branches, List of Books etc are now available online. More documents shall be available within short period. The collection of SOE library is built around the teaching and learning process of the parent organization. The library caters the needs of the students by ensuring a sound reference collection, circulating text books and general books, supplying CDs, and journals, and providing analog or digital copies of the materials. A book bank section is maintained by the library for students belonging to Scheduled Castes and Scheduled Tribes. The PG section includes books for the advanced studies in the discipline. List of new arrivals are sent to the faculty and students as soon as they are being procured. Card catalogues are arranged for searching by author, title, and subject. An alphabetical list of subjects is displayed with class numbers and shelves numbers for easy access and selection. New arrivals are displayed for some days. Three cards are issued for B.Tech Students, M.Tech Students, Contract Lectures in the School and Six cards are issued to permanent faculty of the School.